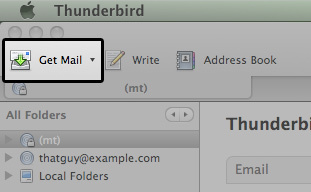 How can I configure email in Thunderbird? Mozilla Thunderbird is a free, open source, cross-platform e-mail and news client developed by the Mozilla Foundation. 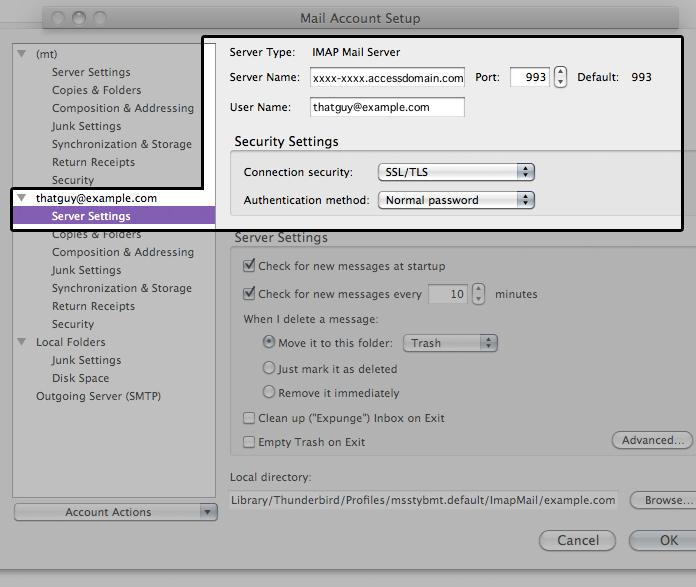 The following article will show you how to setup Thunderbird, the email application, with your email account(s) using the preferred IMAP protocol. Check out our automated tool for easy email set up! Automatically configure email clients on your PC, Mac, or iOS device with just a few clicks. 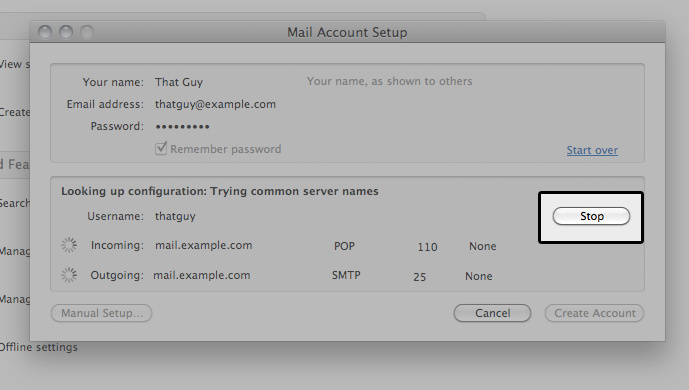 For more information, please read this article: Creating a POP/IMAP email account. Your "email access domain". Read our article What is an "Access Domain"? for more information. This article is provided as a courtesy. Installing, configuring, and troubleshooting third-party applications is outside the scope of support provided by (mt) Media Temple. Please take a moment to review the Statement of Support. 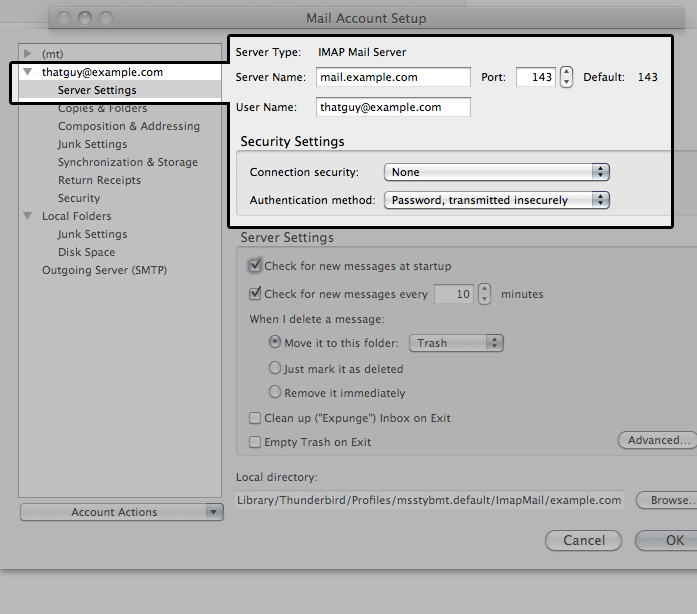 For these instructions, we will be using IMAP with SSL. This will open a new window where you enter your email information. Make sure the "Remember password" box is checked to avoid having to re-enter your password. 3. Thunderbird will attempt to find your incoming and outgoing mail server information. 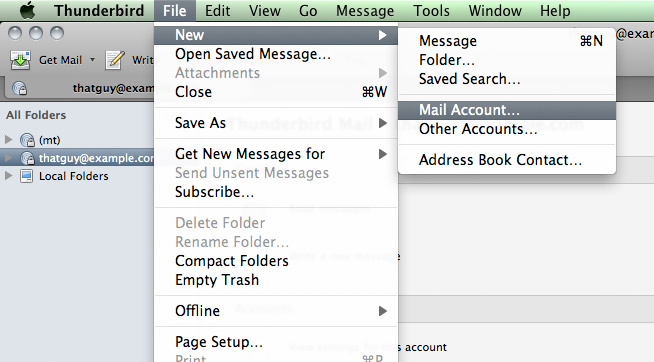 Thunderbird should automatically configure your account for you. If not, proceed to the next section. If you experience difficulty with automatic setup, follow these instructions to manually configure Thunderbird. 2. Next, click on Manual Setup to enter the correct account information. 3. This opens a new window for your server settings. If it's not already selected, click on Server Settings. We will use this page to setup your incoming mail server. 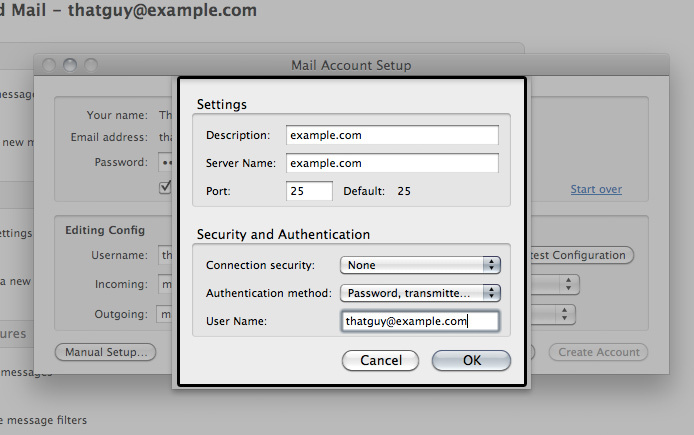 For Server Name, type in your "email access domain". Under Security Settings, choose SSL/TSL for Connection security. Also, make sure your User Name is your full email address. Confirm your settings with this example. 4. 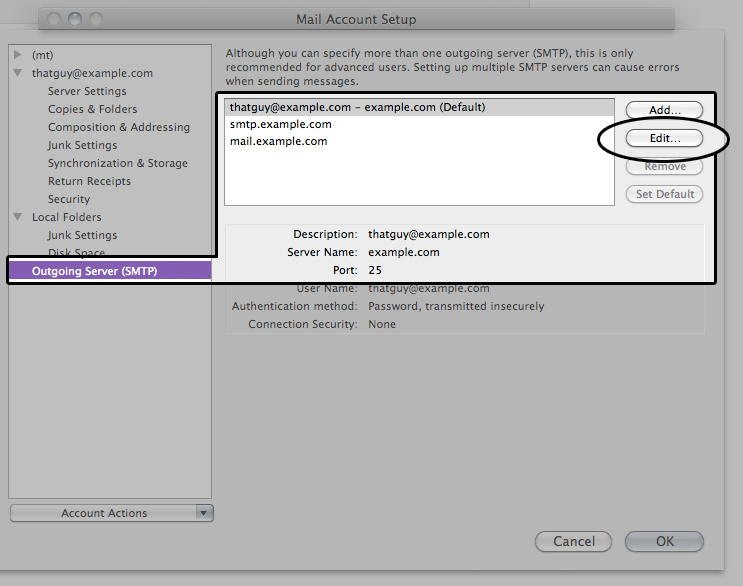 Now, let's move on to your Outgoing Server (SMTP) settings. Choose the outgoing server which Thunderbird created for this account, and click on the Edit... button. 5. For Connection security, select SSL/TLS. Under Security and Authentication, make sure that Authentication method is Normal password. Your User Name should be the full email address. Again, the "email access domain" of "xxxx-xxxx.accessdomain.com" is used as an example; please use your unique email access domain here. Enter your account information as illustrated by this example. Now, go ahead and click OK to return to the main settings page. Then click OK again to return to Thunderbird's main window. 6. Next, click on Get Mail from the top menu. Q: What ports do I use? A: It's possible you may need to manually set the port numbers in Thunderbird. You may also want to test that they are working from your location using the telnet command. ^ The ports used for our IMAP instructions using your access domain. Q: Where can I get extensions and themes (add-ons)? A: Extensions and Themes can be downloaded from Thunderbird Add-ons. Q: I am having difficulty sending or receiving email. How can I check my settings? A: At some point, you might find you're having trouble sending/receiving emails. You may want to check your settings. 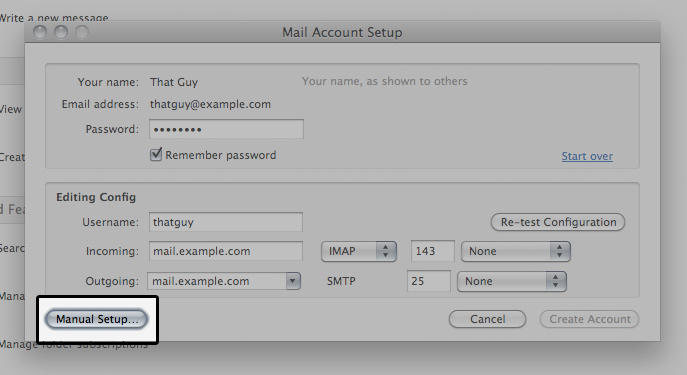 To do this, simply launch Thunderbird and click on Tools > Account Settings. Please compare your settings to the settings provided in this article. Q: Where can I find additional support for Thunderbird? A: Mozilla has created a great community for Thunderbird. You can get started by visiting Mozilla Messaging Support. Should you need to ask a question, you can do so here. The Grid is faster, more scalable, and more reliable.